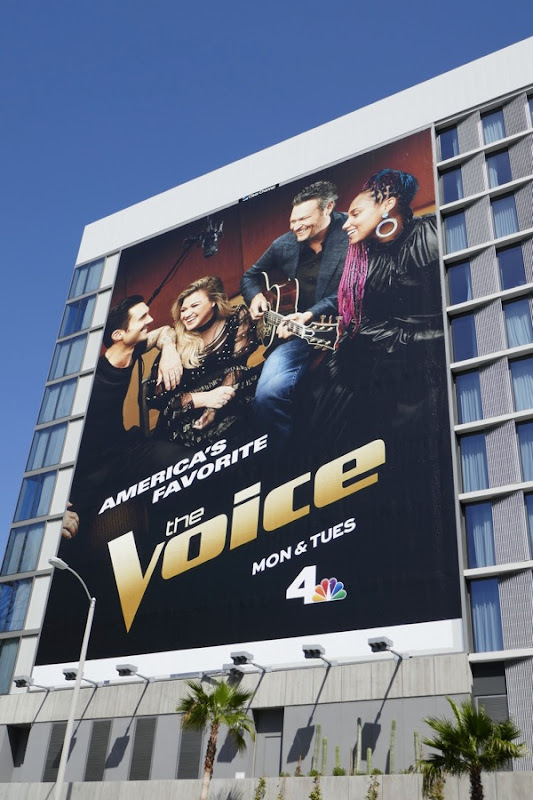 How do you keep a singing competition fresh season after season, the answer it seems is to constantly bring in new coaches and mentors for the contestants to be inspired by. 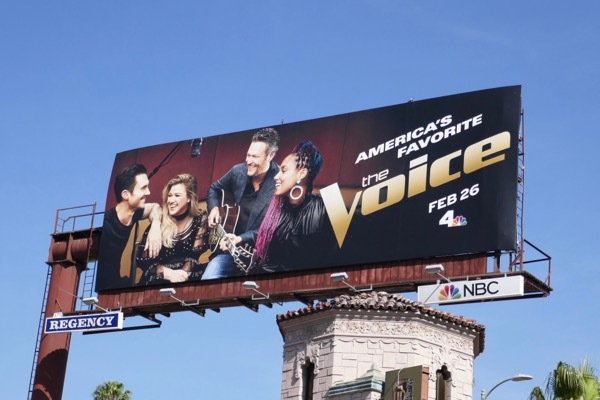 For The Voice's fourteenth season American Idol's very first winner, Kelly Clarkson, joins Adam Levine, Blake Shelton and Alicia Keys in the judges seats. Having been through the audition and weekly competition process herself, the singer who has already released eight studio albums and a plethora of chart-topping hits, is the perfect addition to the panel. 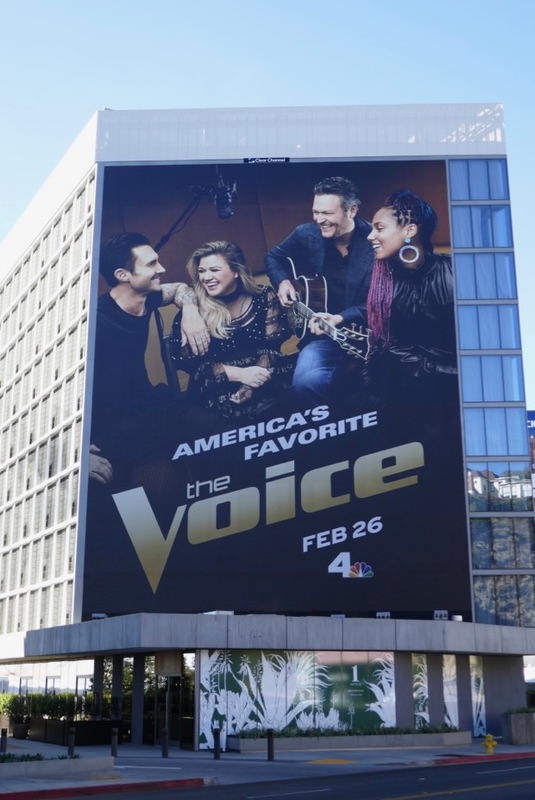 This season fourteen landscape billboard was spotted along Sunset Boulevard on February 3, whilst the giant-sized version was snapped further west along the Sunset Strip on February 19, 2018. 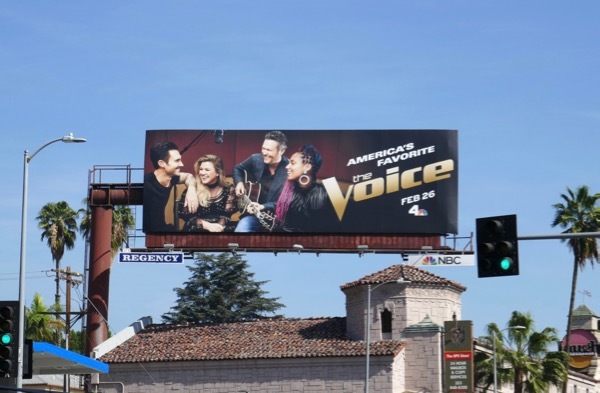 Fans of the show can also check out all these previous season promo billboards for The Voice with all the different coaches from 2011 to date. 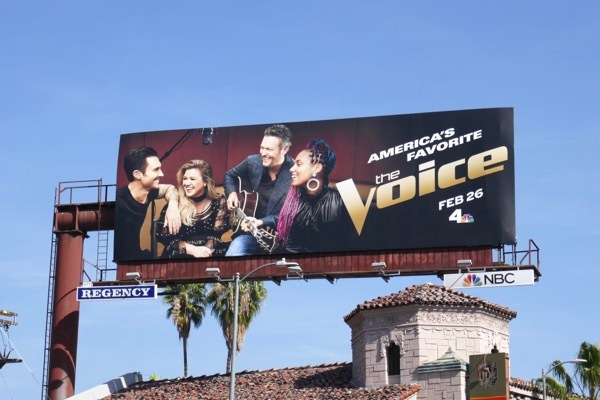 With the music world populated by an embarrassment of iconic divas, Daily Billboard thinks the next way to keep things fresh and relevant on The Voice would be to have an all-female judging panel. It could include past coaches like Christina Aguilera, Gwen Stefani, Miley Cyrus, Jennifer Hudson and Shakira and draw from a wishlist other stars like Pink, Taylor Swift, Sia, Lady Gaga, Adele, Kylie Minogue, Madonna, Cher, Rihanna, Beyoncé, Britney Spears and many more besides. Now that would be an all-star season worth watching. 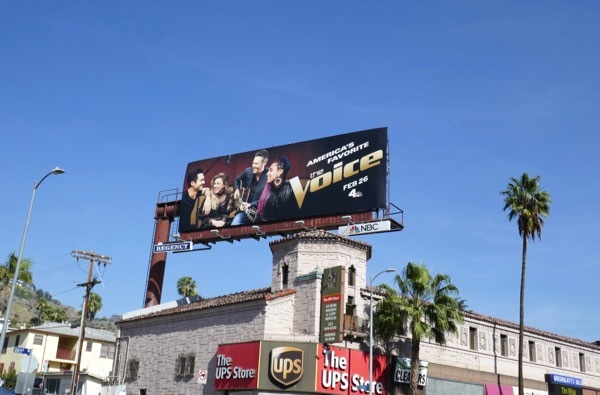 UPDATED: Here's another super-sized billboard for the fourteenth season spied on the flip side of the same building in better lighting along the Sunset Strip at La Cienega Boulevard on April 9, 2018.